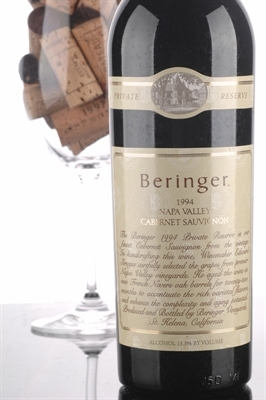 Beringer's Private Reserve has always been one of my favorite California Cabernets, particularly since the late seventies. Beringer's Private Reserve has always been one of my favorite California Cabernets, particularly since the late seventies. They can be drunk young, but age exceptionally well, giving every indication of holding their fruit and evolving nicely for two decades. The terrific 1994 Cabernet Sauvignon Private Reserve offers an opaque purple color, a gorgeous nose of toasty oak, and a silky, concentrated texture with unobtrusive acidity or tannin. The wine possesses layered richness, remarkable balance, sweet, pure fruit, and a finish that lasts for nearly 30 seconds. These wines are aged in 100% new oak, and tend to possesses at least 97% Cabernet Sauvignon, with the balance Cabernet Franc. Amazingly, the oak is not a pronounced component in the final wine, a testament to excellent winemaking and the concentration these wines possess.